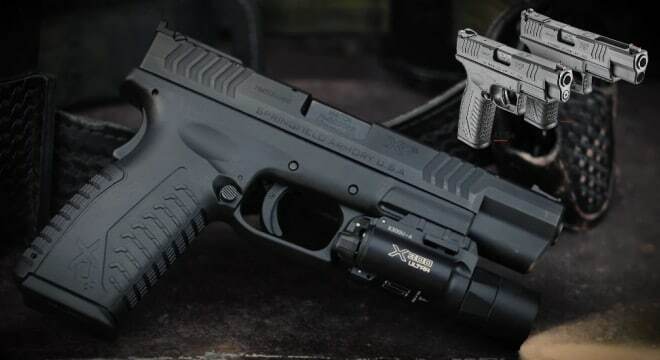 Springfield Armory on Wednesday announced they were adding a pair of 10mm offerings to their popular XD(M) line of handguns. Teased for the past two years, the new 10mm installment to the XD series features a full-sized pistol with either a 4.5- or 5.25-inch Melonite finished match-grade hammer-forged barrel with fully supported chambers. Both variants include Mega-Lock grip texturing with three interchangeable backstraps and a 15+1 magazine capacity. When it comes to sights, the 4.5-inch model has a low-profile combat rear paired with a fiber optic front, while the 5.25 variant runs a fully adjustable target rear with a fiber optic front. Equipped with a full-length guide rod and forged slide, SA touts that the robust guns have stood up to a 10,000-round reliability test without any stoppages. The test, documented shot-by-shot in a two-hour video by Clay Martin, used nothing but Federal Premium Hydra-Shok personal defense rounds, stopping every 1,000 rounds to lubricate the gun and every 2,000 to swap out recoil springs. MSRP is $652 for the 4.5-inch version while the 5.25-inch model goes $779, prices likely to be somewhat less at retailers.